Automatic systems require real-life physical attributes to be measured and converted to electrical quantities ready for electronic processing. Velocity is one such attribute. 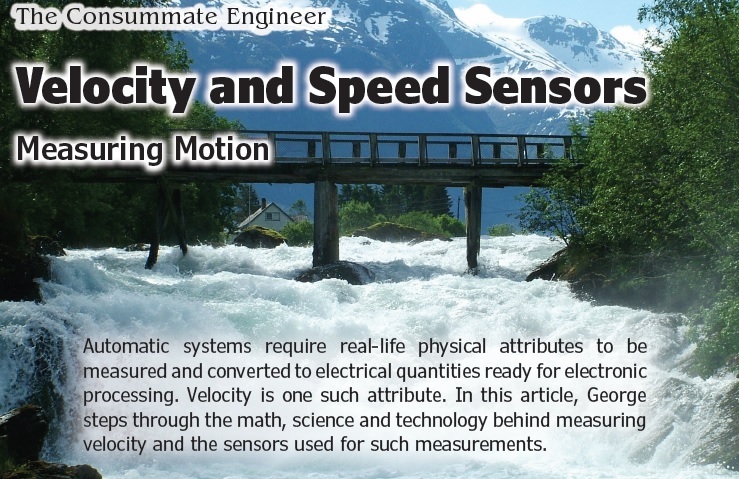 In this article, George steps through the math, science and technology behind measuring velocity and the sensors used for such measurements. Automatic systems respond to a multitude of inputs affecting their output. Real life physical attributes need to be measured and converted to electrical quantities ready for electronic processing. Velocity is one of such attributes. By its definition, velocity is a vector comprising speed and direction of a motion. The speed is the rate of change of an object’s position with respect to some reference point over time. In situations such as an automobile cruise control, the direction of the movement is not important. In other applications—typically a guidance system or aircraft autopilot—the velocity must be determined in three axes simultaneously. In those applications the velocity directions are often referred to as pitch, roll and yaw—although technically those are angular positions and their rates of change. A common unit of speed in the SI (the metric system) is meters per second (m/s). Other units are derived, based on their magnitude, by multiplication or division, such as millimeters per second (mm/s), kilometers per hour (km/h) and so forth. The Imperial system expresses speed in miles, feet or inches per second, hour and such. We should not forget Mach, the unit of speed named after the Austrian physicist Ernst Walfried Mach. It is used primarily in aerospace applications. The Mach number is dimensionless, expressing the ratio of the local flow speed (v) over the speed of sound (c) in its particular medium, often air. Therefore M = v/c. Mach 1 equals to the speed of sound 331.46 m/s (1,193.26 km/h or 741.45 miles/h). The speed of sound, however, changes with the conditions of the medium, such as its temperature, so the Mach number may vary while the ground speed remains constant. Nautical and subsonic aviation in the English-speaking world commonly use a Knot (kn or kt). 1 kt = 1.151 miles/h = 1.852 km/h. The angular—rotational velocity—of an object is the rate of change of the angular position with respect to time. It is a measure of how fast the object is turning. Angular velocity is also a vector with the direction being the axis about which the object rotates. In many control systems the axis is stationary, while our primary interest is the rotational speed. The common unit is rotations per minute, or RPM. The speed is defined as the change of position over time. When the amount of time is substantial with respect to the traveled distance, the resulting speed is likely to be considered average. For the time interval approaching zero the immediate speed is dx/dt. Low speed displacement measurement can be performed, for example, by a linear variable differential transformer (LVDT) , but the range is small due to the mechanical limitations of the transducer. At the opposite extreme, optical, ultrasound or radio displacement detection methods are used to establish the time for an object to pass detection points. Two basic methods are common. 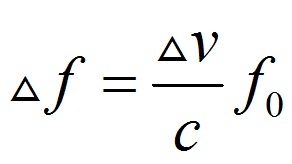 One is the measurement of the distance by the time of flight and calculating the speed per equation #1.
where ∆f = f – f0 and ∆v = vr – vs. ∆v is the expression of the velocity of the receiver relative to the source. To measure speed, it is often convenient to convert a linear velocity into a rotary one, using a tachometer (essentially a dynamo), Hall Effect diodes or rotary encoders. Anemometers are a typical example where the fluid (or air) flow rotates a small propeller which rotates a tachometer. Tachometers have been commonly recognized as automobile instruments, but the old mechanical devices are no longer ideal for modern electronic control. Today the automobile speed is often derived from counting the ignition firing. Some motors comprising an integral tachometer are often considered too bulky and too expensive by today’s standards. Instead, optical or magnetic sensors are preferred. 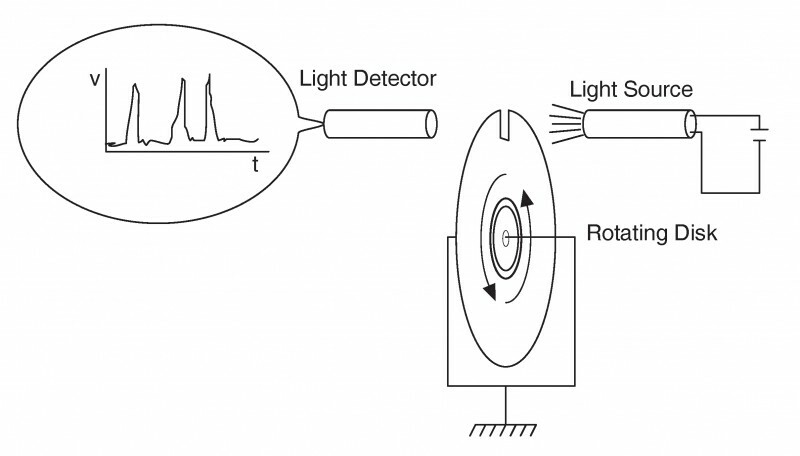 The principle of optical speed detection is shown in Figure 1.